Enjoy an exciting tournament and a royal feast with a trip to Atlanta’s Medieval Times, and spend an evening in a sumptuous castle lined with coats of arms, artifacts and armor. 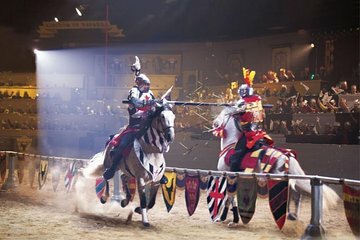 See a thrilling display of horsemanship and falconry as you linger over a medieval-style, four-course meal. Hear the pounding of hooves in the Grand Ceremonial Arena, cheer your personal knight through a series of jousting rounds, then see Queen Maria Isabella crown the evening’s champion with plenty of fanfare and pomp. This was lots of fun, good food and a good show.